A whole lot of Quebecers are about to get an incredible experience travelling directly to Israel aboard Air Transat. The Montreal-based airline kicked off its Trudeau to Ben Gurion non-stop service as a sort of birthday bash, marking its 30 years in business and highlighting Montreal’s 375th anniversary. 150 years of Canadian federation, as well as 100 years of Federation CJA. The event took place in the ultra-modern Montreal Science Centre at the Old Port. There was an interesting mix of politicos, business leaders, young entrepreneurs and community who’s who. English, French and Hebrew-speaking, Kosher or not, young and less young, the audience reflected the multicultural, hip crowd of would-be travelers that Air Transat is targeting. Airline prez Jean-Marc Eustache, lead off the formalities by saying that they weren’t looking to become mere transporters. The airline’s strategy is to build travel experiences with local partners in Israel to offer excursions, lodging and tours to meet the needs of Quebec couples, families and singles alike. And, publicity will soon begin to promote Montreal and Quebec as a hot tourist destination for Israelis. Consul General Ziv Nevo Kulman was beaming with excitement at the prospect of tens of thousands of Quebecers seeking a taste of Israel. Whether it’s for the food, the wine or the music, for exploring or for religious travel, Israel has it all, said the coolest diplomat Israel has sent to Montreal in modern times. The Israeli Consul for Tourism, Uri Steinberg, said that the relationship between Israel and Air Transat would flourish, like a romance, as they become closer and closer, falling in love with one another. Quebecers will love Israel, he said. Montreal City Councillor and Executive Committee member Lionel Perez said that Montrealers will benefit from being five or six hours closer thanks to the direct flights and that Israelis will come in large numbers to enjoy Montreal’s flair, sites and culture. And we have great religious sites to share with them such as the St. Joseph’s Oratory, the Notre Dame Cathedral and eventually a downtown Expos stadium! The Transat folks created a true Israeli atmosphere, raffling off two free flights for two to Israel, serving spicy, tasty hors d’ouevres and five kinds of humus provided by Alan Serour of Beso Catering. A 5-piece orchestra belted out Klezmer tunes and Israeli wine flowed freely. Good luck to Air Transat in finally bringing back direct service to Ben Gurion airport after a decades long gap. Here’s to falling in love with Israel! It’s no surprise that the first visit to a local mayor and council by Israel’s new Consul General in Montreal was right here in Cote Saint-Luc. 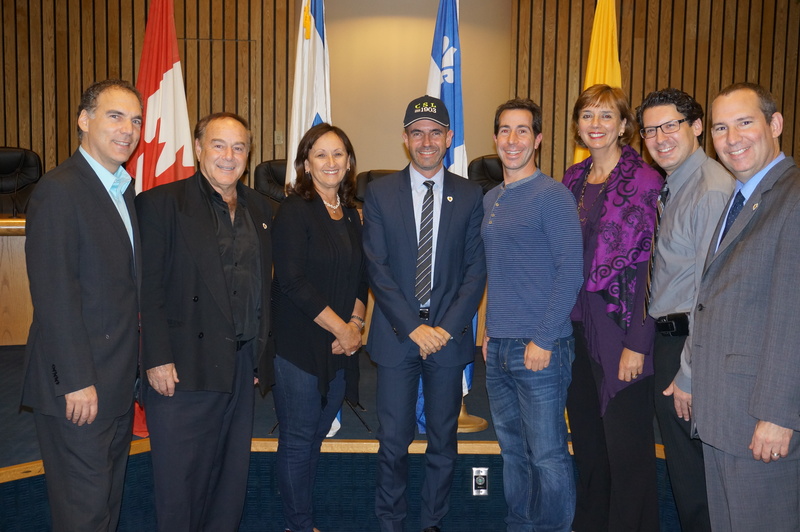 Ziv Nevo Kulman has been installed in Montreal for barely two weeks and was warmly welcomed to Cote Saint-Luc city hall to introduce him to a community staunchly supportive of, and connected to his native land. Kulman indicated he felt right at home around the council table with the many words of praise for his country and support for his mission across Quebec. “I feel the love,” he said of his reception to the community. Cote Saint-Luc twinned with the coastal municipality of Ashkelon in 1975. The flag of Ashkelon has been displayed alongside the CSL flag in our mayor’s office ever since and is identified with a sign on Cavendish Blvd. Ashkelon Gardens was created behind the CSL Public Library. Ashkelon Crescent was developed in the 1980s. Westminster Park was renamed for Prime Minister Yitzhak Rabin in the 1990s. Yad Mordechai Place was developed in the 1990s. Ilan Ramon Crescent was named in memory of the first Israeli astronaut. Have a look at the video he produced as an introduction to his new posting. This consul general will be a hit in Montreal and is excited to spread the story of his amazing country to people all over Quebec. Welcome Ziv. Baruch Habah. You’re always at home in Cote Saint-Luc.